Now that summer is almost officially over, and I haven't written a blog post since the beginning of summer back in May, I thought it's about time that I shared some of the meals I've been enjoying over the last few months! Summer - as with every other time of year lately - was super busy for me, so not only did I not have time to post, but I didn't have a lot of time for cooking. I stuck to mostly easy meals and standbys, like vegetable quinoa or pasta, sandwiches, and salads. But with fresh, local vegetables available, simple meals are all you need! Here's a little recap of some of my favourite dishes from this past summer. And don't forget you can follow along a little more frequently with me over on Facebook or Instagram! I finally started trying smoothie bowls for the first time and love them, though I've been lazy lately and haven't made one in a while. 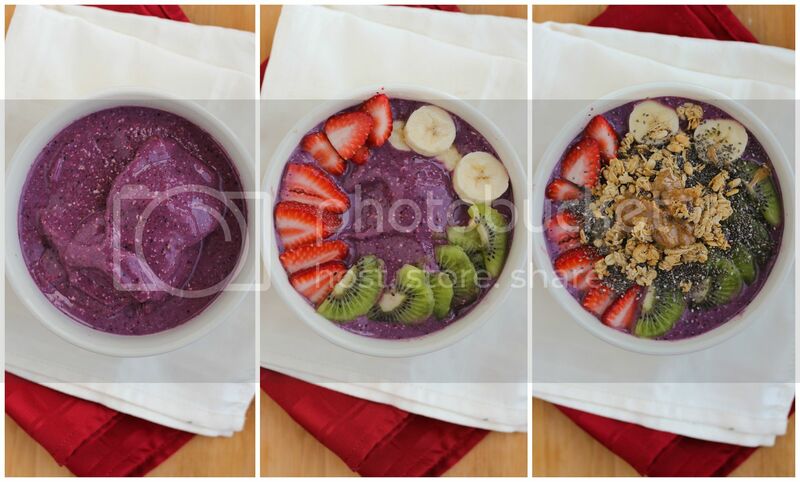 The version pictured above had a base of frozen mixed berries and bananas, almond milk, oats, and flax seed, and was topped with strawberries, bananas, kiwi, almond butter, berry granola, and chia seeds! Quinoa is always a staple around our home. 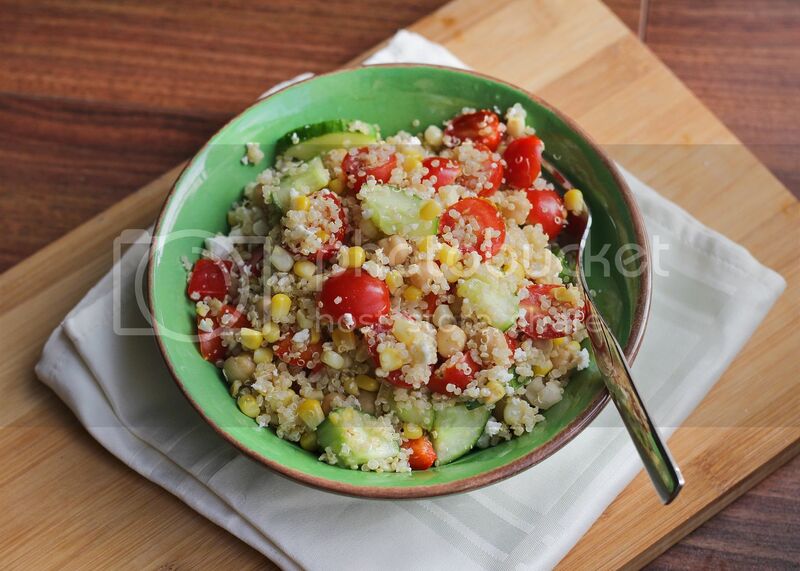 In the summer I love using fresh vegetables like cherry tomatoes, red pepper, corn, and cucumber, tossing the quinoa with a bit of lemon juice and olive oil, and adding some feta and fresh pepper. The other version of quinoa we make all.the.time. is this southwestern version with black beans, pinto beans, chile powder & cumin, sauteed veggies (zucchini, red pepper, tomato, corn, mushrooms), and a little salsa and cheese. We never get sick of it! 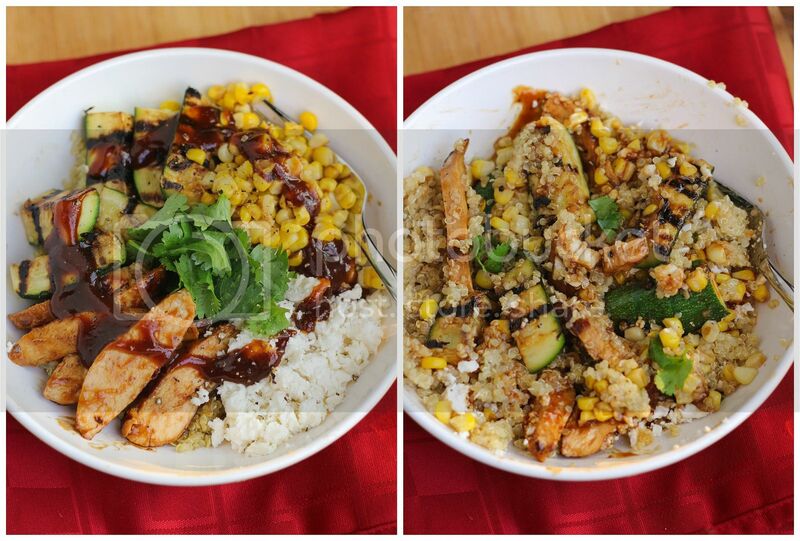 I also tried a new version this summer with this grilled bbq chicken, zucchini, and corn quinoa salad recipe from Closet Cooking. 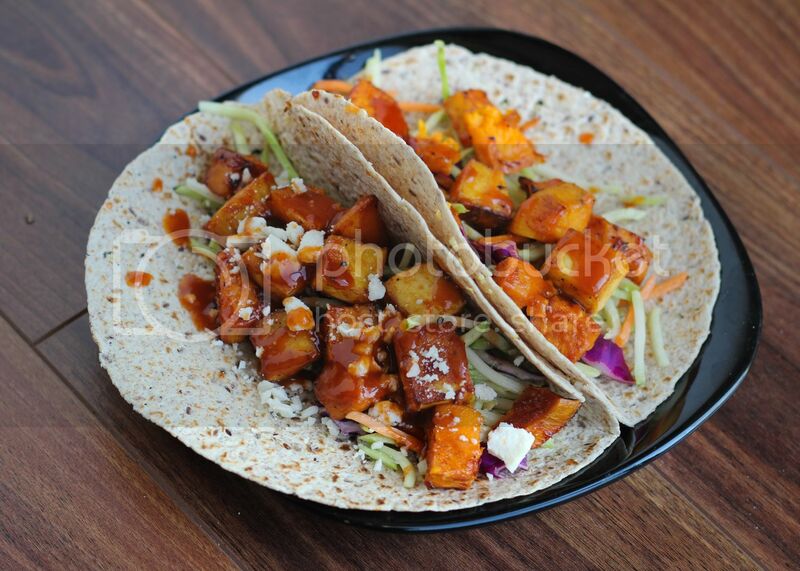 I loved the addition of barbeque sauce, and we loved it even more with shredded cheddar instead of feta the next day! 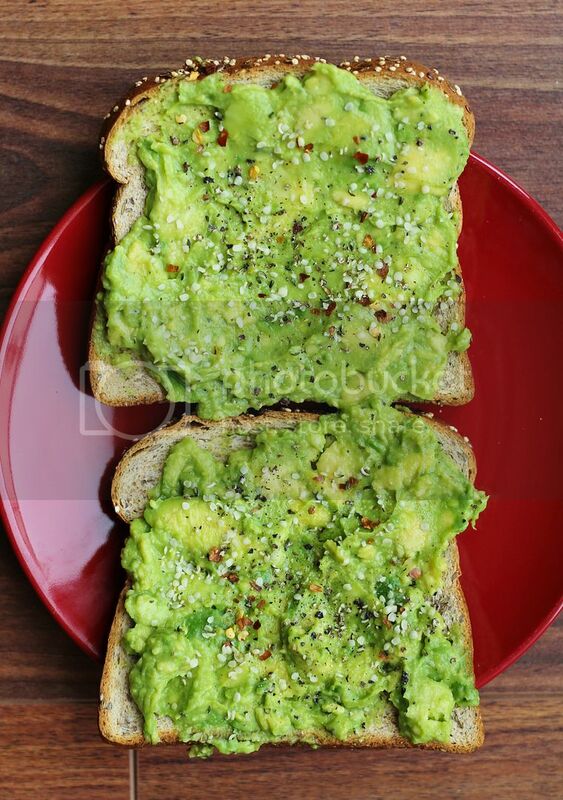 Avocado toast is always a staple when I'm pressed for time (and willing to splurge on avocados)! I finally bought hemp seeds recently and love sprinkling them on everything! 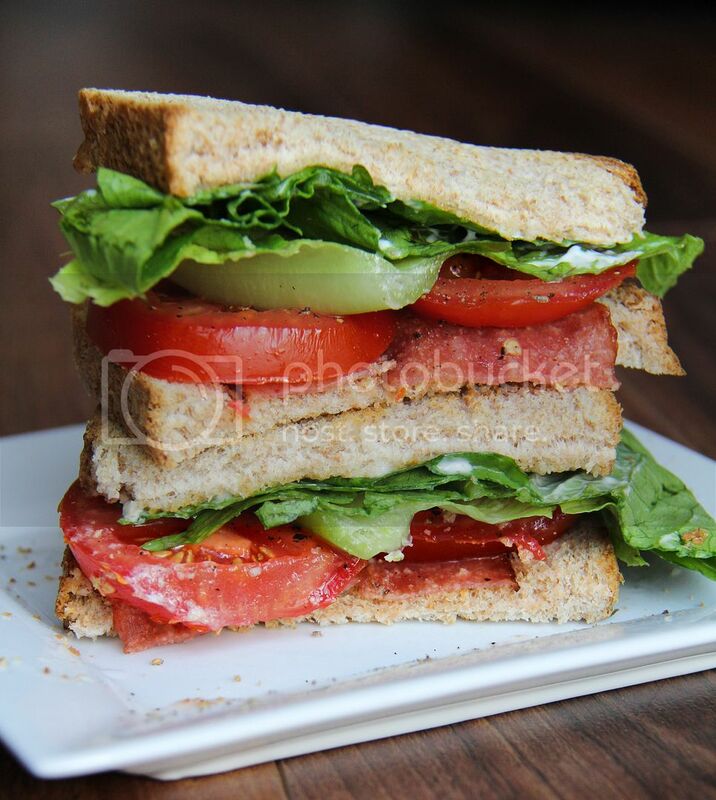 Also super easy were these turkey bacon BLTs we had a few times. I wish I made them more; I feel like I hardly had any fresh tomatoes this year! This gnocchi was the result of grabbing whatever I could find at the market one evening, and I ended up loving it! 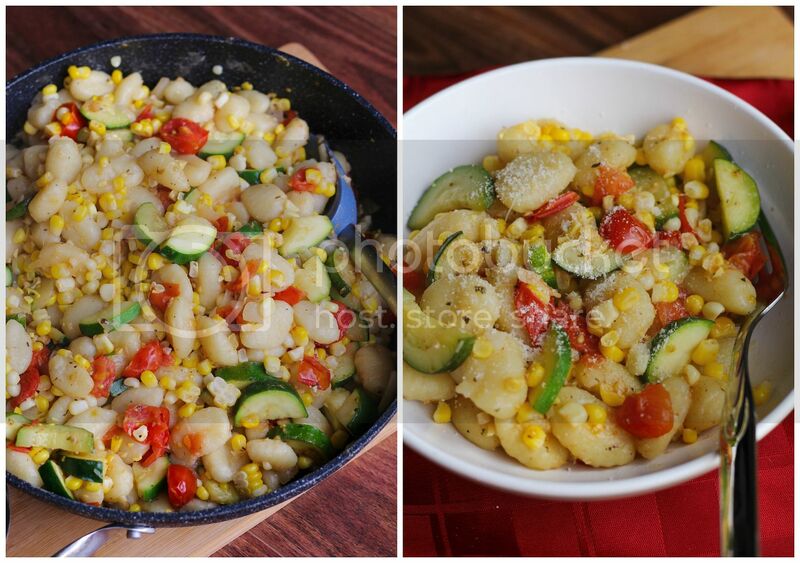 I just cooked some storebought gnocchi and tossed it with sauteed zucchini, tomatoes, corn, onion, and garlic, and topped it with some parmesan cheese. Easy and tasty! 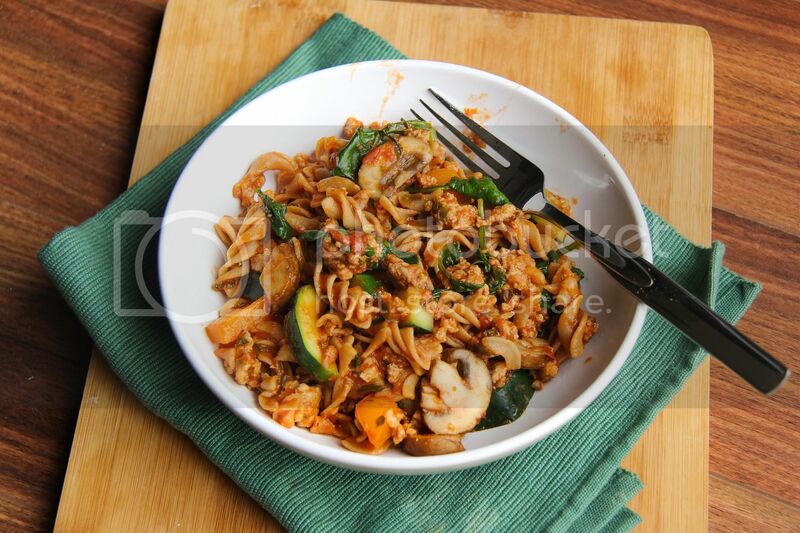 The other pasta recipe I tend to make all the time when I can't think of anything else is whole wheat pasta with sauteed vegetables (in this case zucchini, mushrooms, and spinach), ground turkey, and storebought pasta sauce. It's healthy, filling, and makes great leftovers! 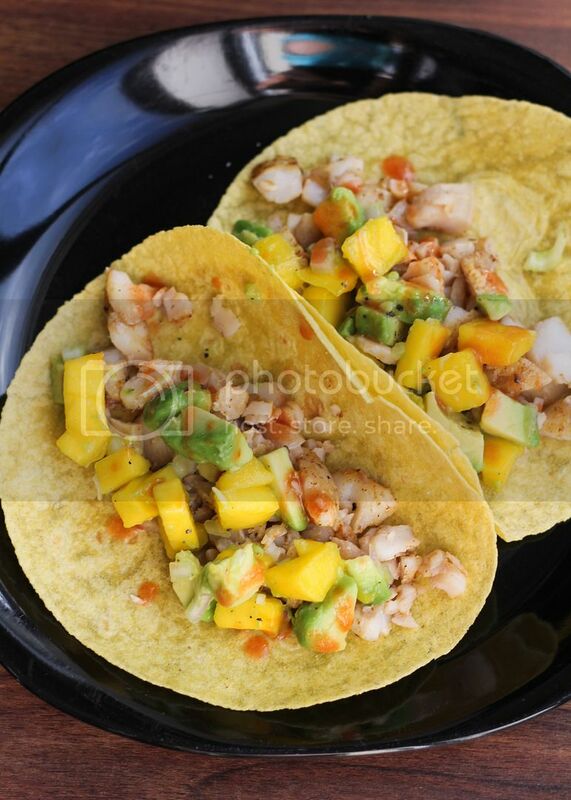 ... As well as fish tacos with avocado mango salsa (and a little hot sauce)! 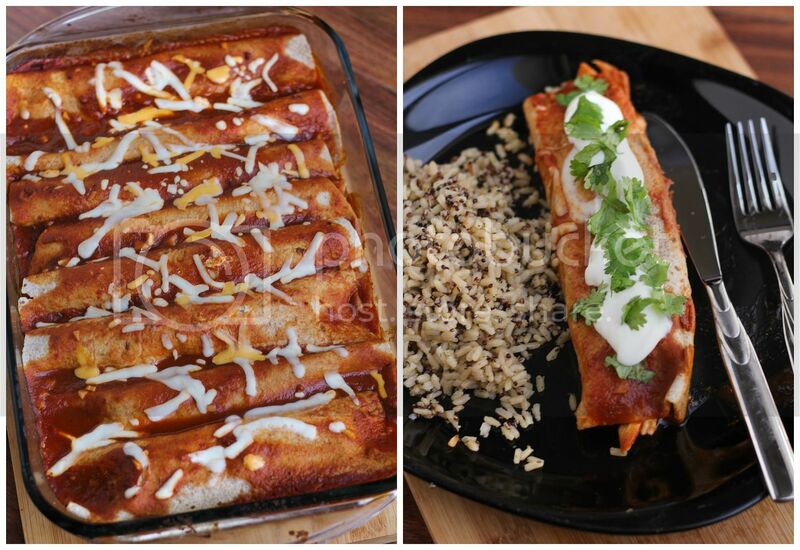 I've made these chipotle chicken enchiladas from Skinnytaste a few times before and we always love them! I just poach the chicken beforehand and put most of the cheese inside the enchiladas rather than on top. 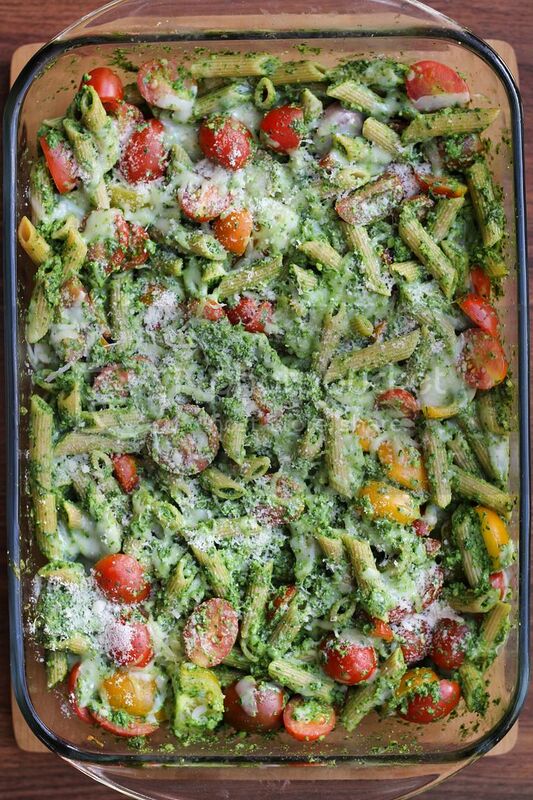 This baked pesto whole wheat pasta from Pinch of Yum is another summer favourite of ours. It's easy to throw together is a great way to pack in lots of greens. 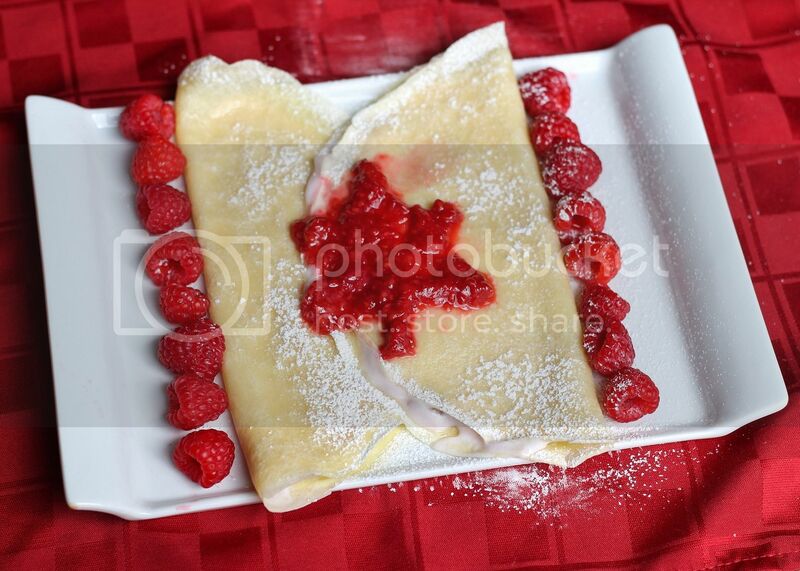 On Canada Day, I made a festive breakfast for us by cooking up a batch of vanilla crepes, filling them with yogurt, and topping them with some cooked and fresh raspberries to form a Canada flag! Later that day, I extended the theme with Canada flag-inspired appetizers. 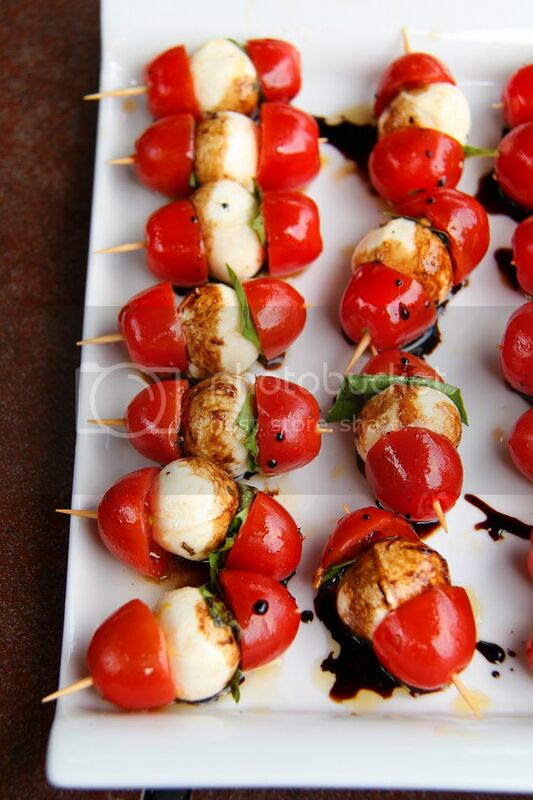 Pictured above are simple skewers made with grape tomatoes, marinated bocconcini, basil, and a balsamic reduction. The colours (ignoring the green) were meant to resemble the flag, but everyone liked these so much I made them for non-Canada related gatherings too! 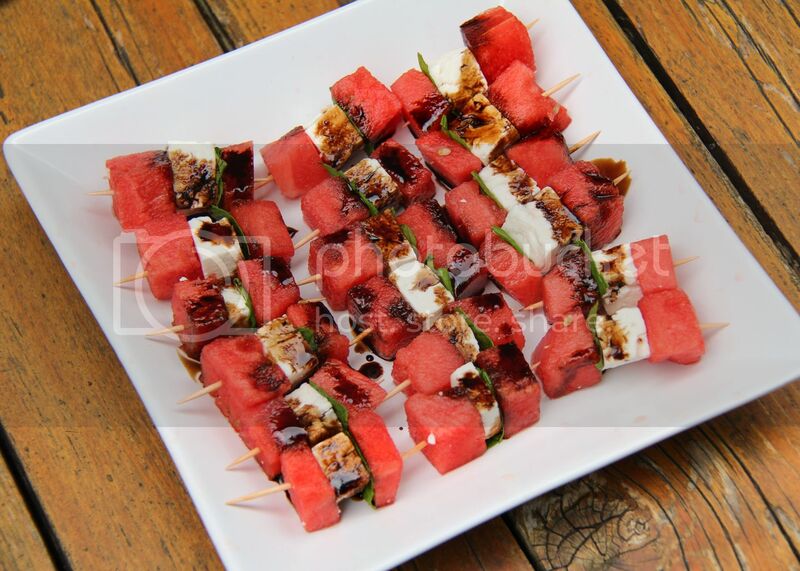 My other, perhaps less obvious, flag-themed appetizer were these watermelon, feta, and mint skewers, also with a balsamic drizzle. These are one of my favourite summer appetizers that are always a hit! 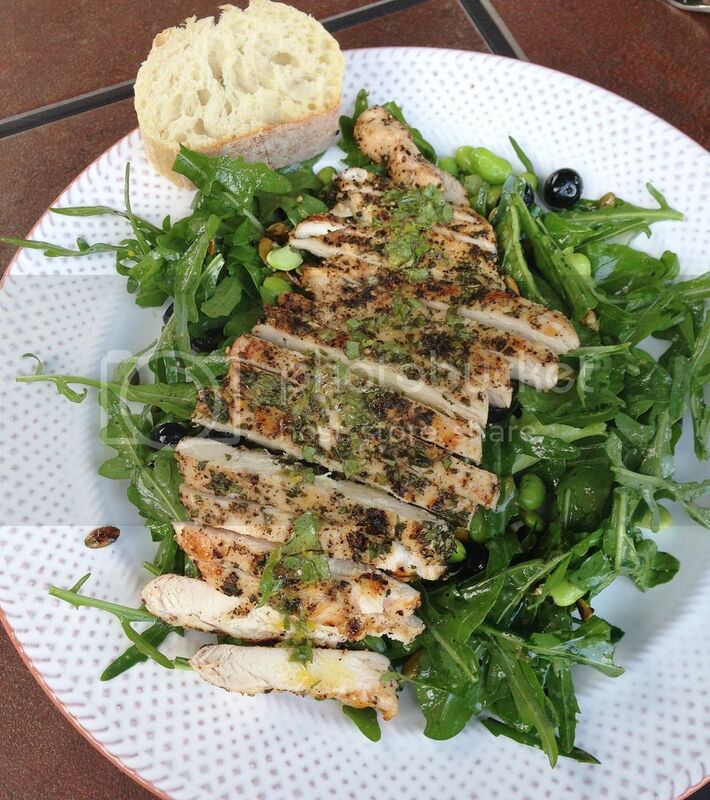 This edamame and blueberry arugula salad with herbed chicken was one of my favourite dishes that my parents made for me this summer! 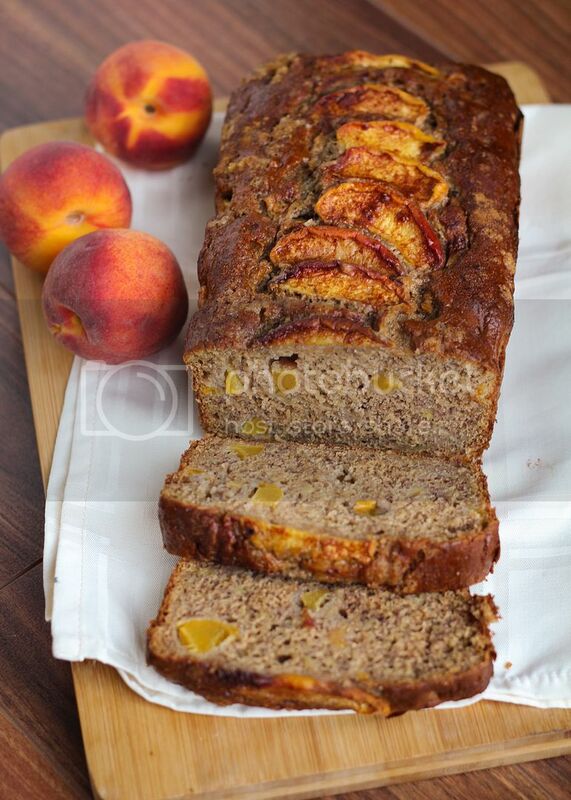 I didn't do a lot of baking this summer but one of my favourite baked goods was this low-fat cinnamon peach banana bread from Ambitious Kitchen. I replaced half the flour with whole wheat and the butter with coconut oil but you wouldn't know it was healthy! ... 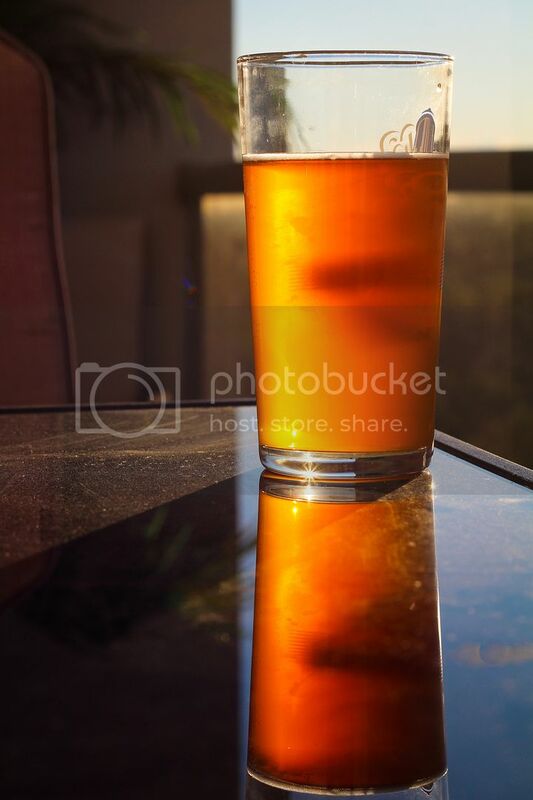 Though beer doesn't hurt either ;) Cheers to summer 2015! I know it's a little late for brussels sprouts season and most of you are probably too focused on asparagus right now to think about wintry vegetables, but I'm happy to eat brussels any time of year (and we don't have local asparagus here yet last time I checked)! I can also enjoy a meal like this any time of year - roasted salmon, vegetables, and potatoes all tossed in an easy homemade glaze. There's nothing revolutionary about this dish and you've likely seen or made a version of it once or several times before, but it's a great recipe to have in your collection because it's simple, healthful, flavourful, and satisfying! 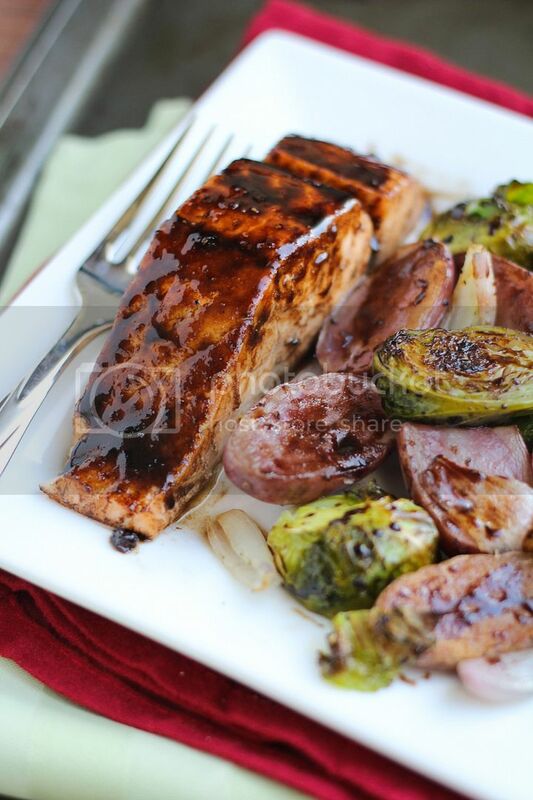 I love adding a glaze to salmon because that little extra step makes such a difference in flavour; I usually use whatever ingredients I have on hand but that often includes maple syrup. I also love tossing roasted brussels sprouts and potatoes in balsamic vinegar and eating them just like that. 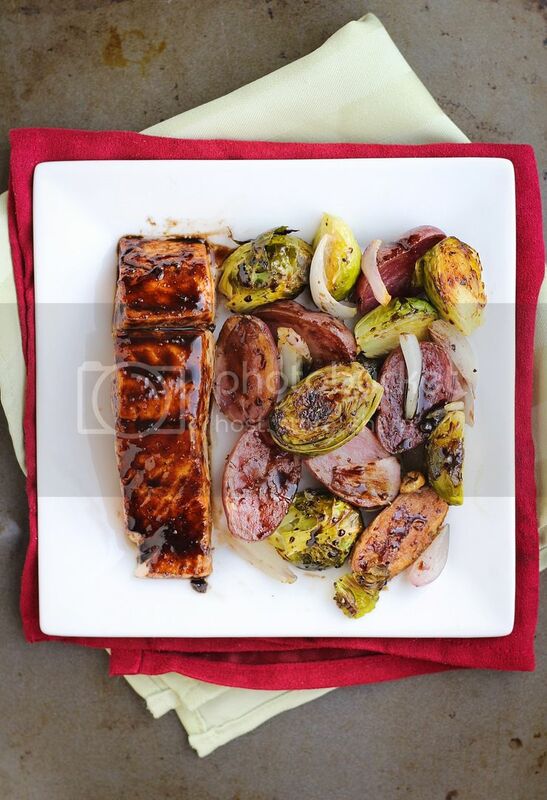 So I decided to combine those flavours together with a maple balsamic glaze that I brushed heavily on the salmon and lightly on some roasted brussels sprouts, potatoes, and shallots on the side. I don't often like coordinating main dishes with side dishes because it involves too much work but everything about this dish flows easily together, doesn't take long or dirty too many dishes, and most importantly tastes so good you'll want to add it into your meal rotation no matter the time of year! Toss brussels sprouts, potatoes, shallots, and garlic with olive oil. Season with salt and pepper and spread in a single layer on a foil-lined baking sheet. Roast in preheated oven for 20-25 minutes. Meanwhile, prepare glaze by heating 1 teaspoon olive oil or a light drizzle in a small saucepan over medium heat. Add garlic and cook for about 30 seconds. Add balsamic vinegar, maple syrup, Dijon, salt, and pepper. Let simmer, stirring often, and watching closely, until slightly thickened. This could take around 5 minutes. I don’t reduce the glaze until it’s completely thick; I remove it from the heat when it’s thickened but still pourable. Remove vegetables from oven and toss. Brush glaze over salmon fillets (you won’t use all the glaze) and place on the same or a separate foil-lined pan, skin side down. Return salmon and vegetables to oven and roast for another 10-12 minutes or until salmon and vegetables are cooked through. 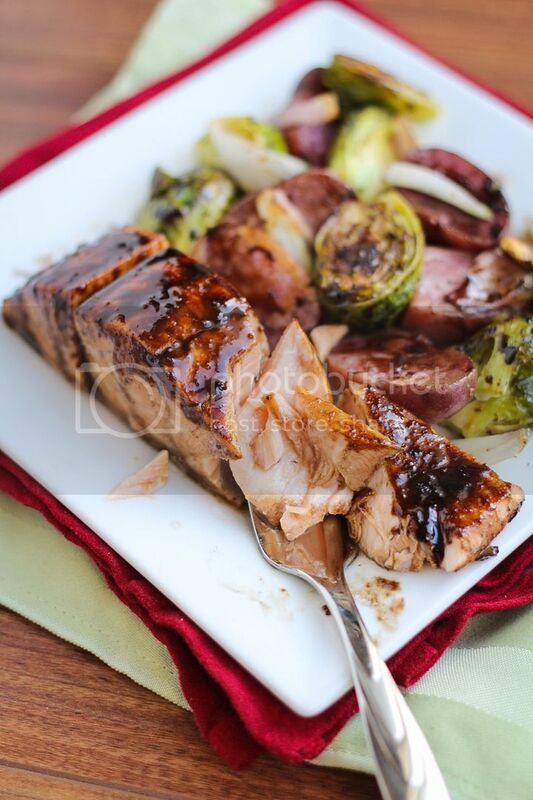 Brush remaining glaze over salmon and roasted veggies. Season with salt and pepper if desired. 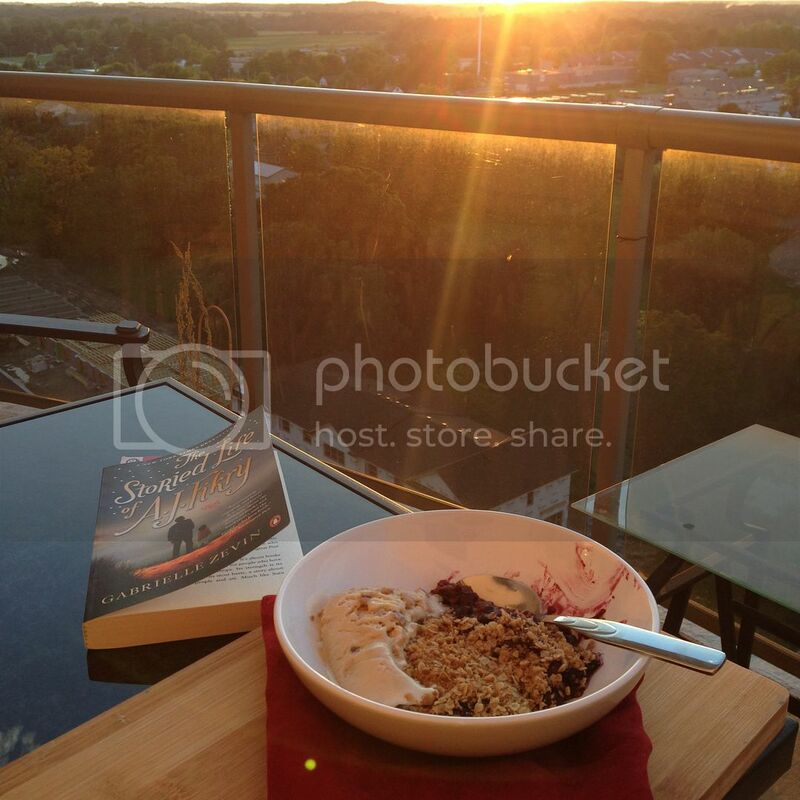 If you've been reading my blog for a while, you'll remember that I used to do monthly "recaps" of memorable meals and occasionally other activities and photos worth sharing from the month. I haven't done one in a while, but I'm trying to start them again as they're a great way to share food and recipes I've tried and loved from other blogs, cookbooks, or restaurants. Of course I'm late as usual by posting March's recap late into April, but I'm still trying to get used to fitting blogging back in my life! I also post most of these photos regularly on Instagram if you'd rather follow along there instead of reading these summary posts! Starting off with breakfasts, I've only just started making overnight oats, which I've seen a million times but have been hesitant to try because of the idea of cold oats. Turns out they're delicious, and make breakfast so easy - just a few minutes of prep the night before means breakfast is ready and waiting in the fridge! 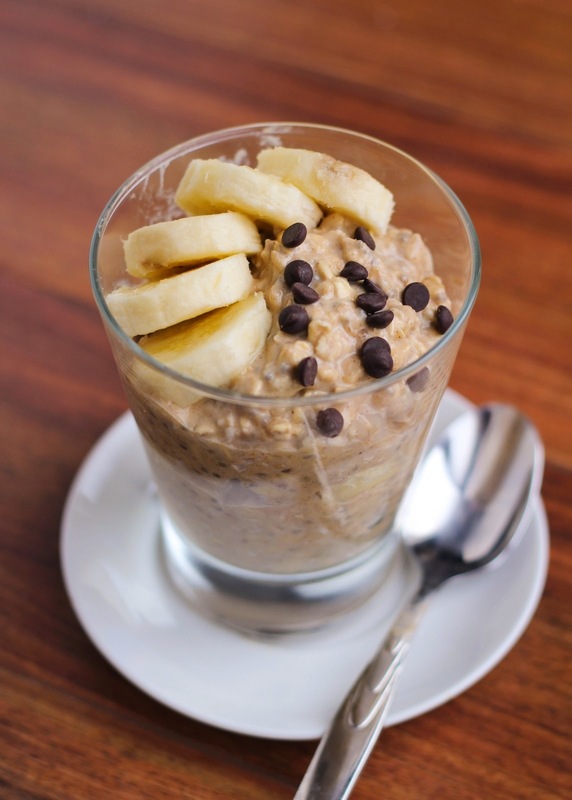 I've made this peanut butter and banana overnight oats recipe (pictured above) a few times now but hope to try other flavours in the future! I'm also late to the smoothie bowl trend but have hopped on board lately! I make smoothies all the time and haven't seen the need to eat mine with a spoon before, but topping them with granola, fruit, seeds, nuts, goji berries, etc. makes them even better! Pictured above was a chocolate coffee protein version that was a bit on the thin side, but I'm getting the hang of it now! Of course regular smoothies still make a regular appearance in my life. This was a "Super Boost Smoothie" from Pure Juice Bar which was delicious. 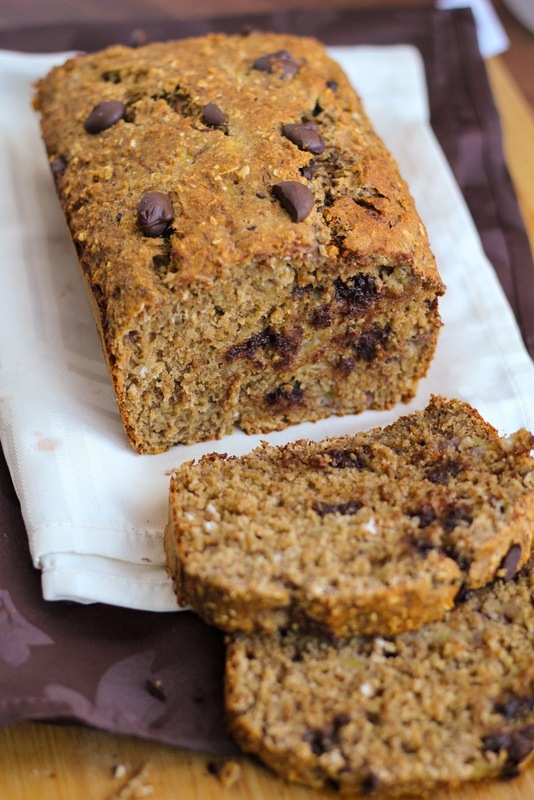 I've been working on a healthy (oil-free, dairy-free, refined sugar-free, except for a few chocolate chips ;)) banana bread recipe but haven't gotten it quite right yet. If I ever do, I'll be sharing it on here! In not-so-healthy breakfasts, I made these peanut butter chocolate chip pancakes for my fiance as a birthday treat. Melted peanut butter is one of my favourite pancake toppings! 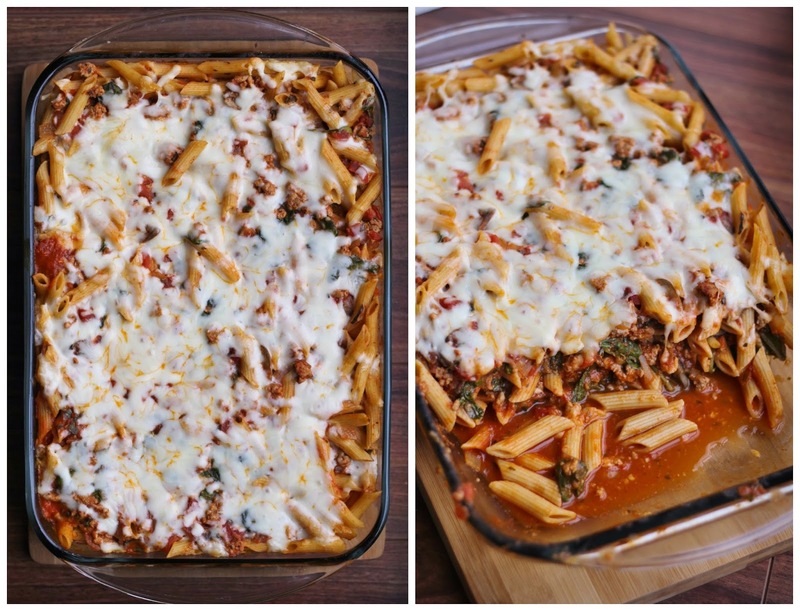 This baked whole wheat pasta with ground turkey, mozzarella, mushrooms, and kale (I used spinach this time) is one of my go-to easy and healthy meals that makes great leftovers! 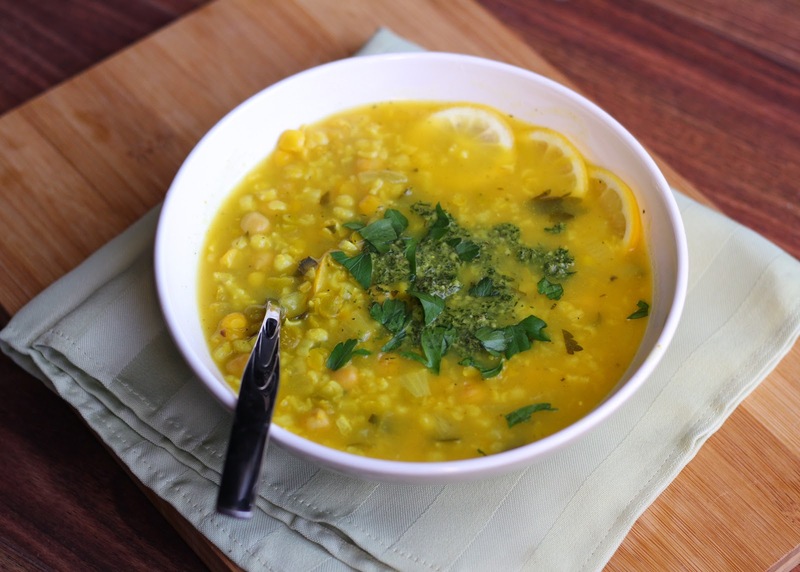 I tried this lifting lemon garlic rice & lentil soup from Happy Healthy Life when I felt a cold coming on. I ended up using too much lemon so it was a bit overpowering, but otherwise this was a fun twist on soup! I often make some version of southwestern quinoa and it's always delicious. 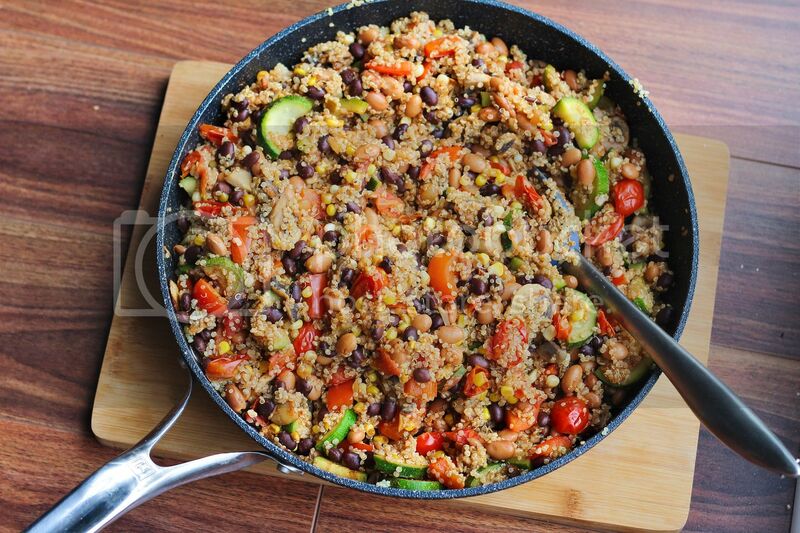 Just cook quinoa in vegetable broth, sautee some corn, black beans, onions, garlic, and mushrooms if you have them, and toss it all together with some cheese, salsa, or hot sauce! This was the veggie burger at one of my fave new restarants, Raw Juice Co - it was delicious! I need to keep going back here to try everything on their menu! 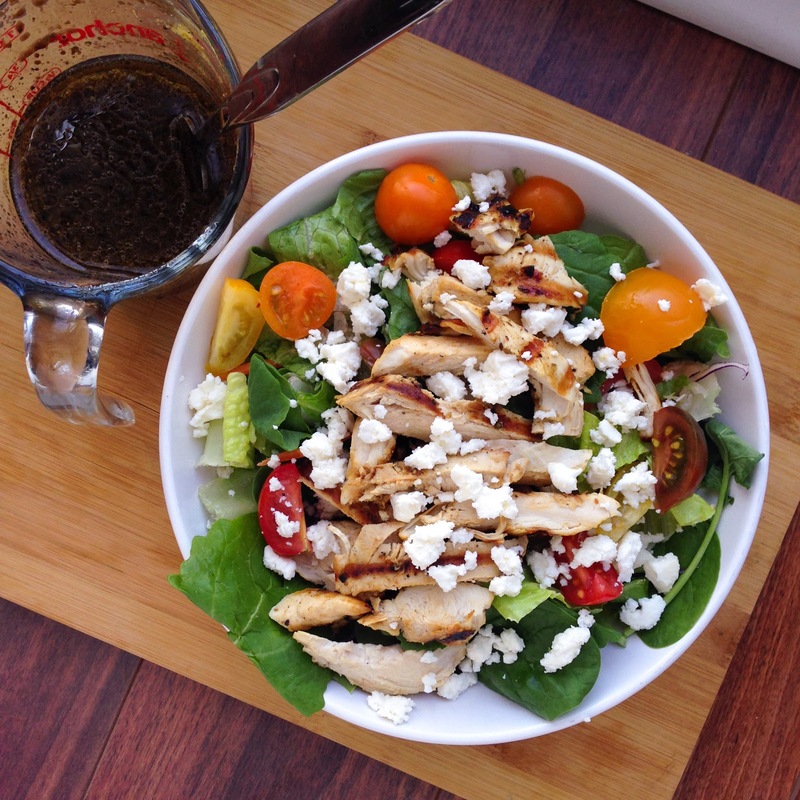 When out of dinner ideas, a grilled chicken salad is always a good choice, and feta is a must in my opinion. We got a delicious jar of chocolate dulce de leche at Christmas so I decided to use some of it up in cookies. 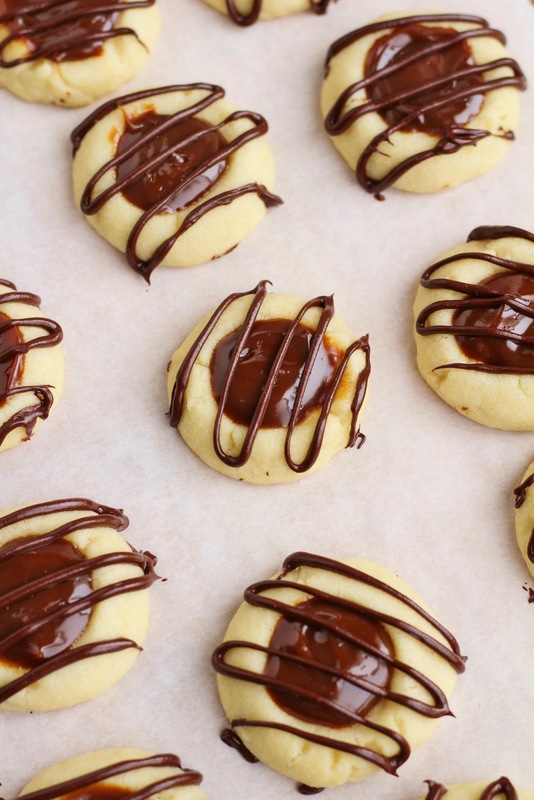 I used the same recipe from my raspberry shortbread thumbprint cookies but filled the middle with the dulce de leche and topped them with melted dark chocolate chips. Easy and tasty! 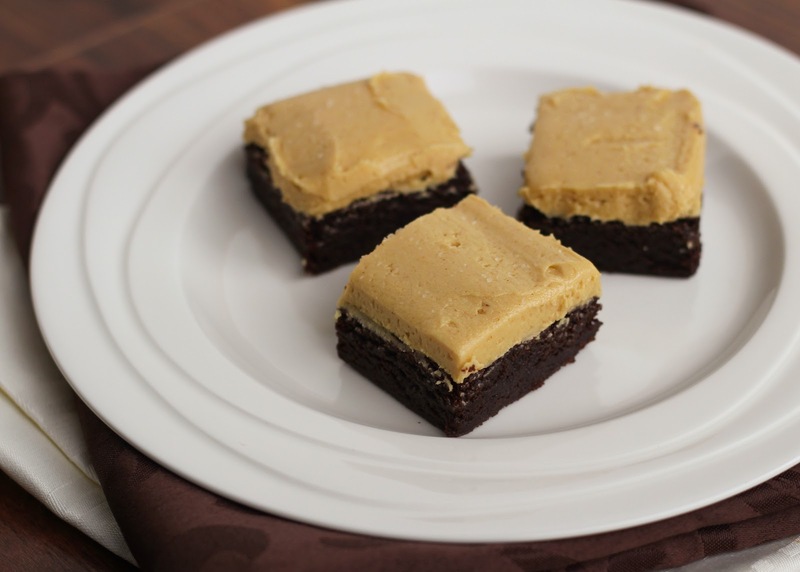 I also tried these cocoa brownies with peanut butter frosting, which are from Not Without Salt and also appear on Love & Olive Oil, though I followed The Wednesday Chef's method which involves browning the butter first. At first taste I wasn't blown away by these but everyone I shared them with loved them, and when I had one the next day I liked it a lot better. The brownie layer is dense and fudgey which is nice for a cocoa brownie and the peanut butter frosting wasn't too sweet, though I did think it was a little too thick so I didn't use all of mine. That's about it for March, and I guess an April recap isn't too far away now! Hope you enjoy these posts! I'm happy I decided to try to start posting recipes again just in time for Easter. I love all food-related holidays but Easter is especially nice because after the heavier meals at Thanksgiving and Christmas, we now get to celebrate bright and fresh flavours that go along with the start of springtime. Whenever I try to think of Easter recipes my mind always goes straight to carrots. As part of our Easter dinner last year, my sister made roasted carrots and radishes with a lemon dill pesto (inspired by With Food + Love) and the flavours worked really well together. So I decided to turn that concept into an appetizer, with the addition of feta because feta makes everything better! This dish looks a little fancy but is really easy to prepare. I just chopped and roasted some carrots in the oven, then whipped together a lemony dill pesto in the food processor. 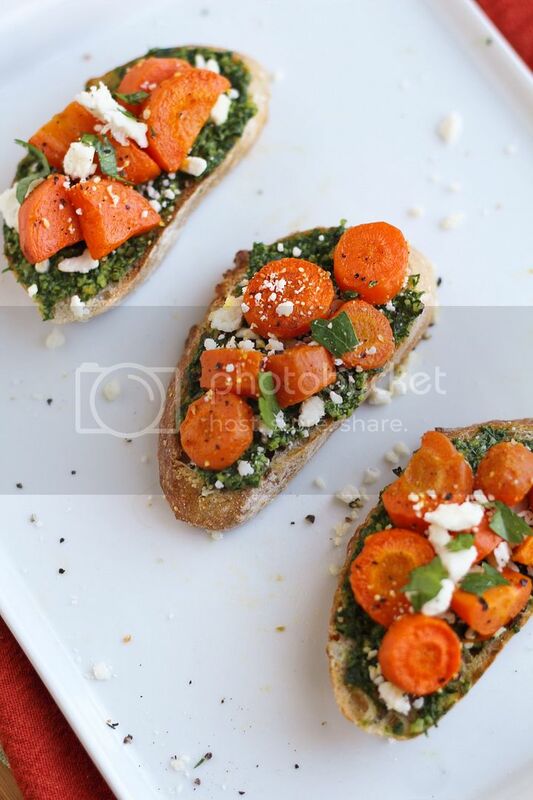 I toasted some whole wheat baguette slices, spread some of the pesto on top, then topped them with the carrots and feta. 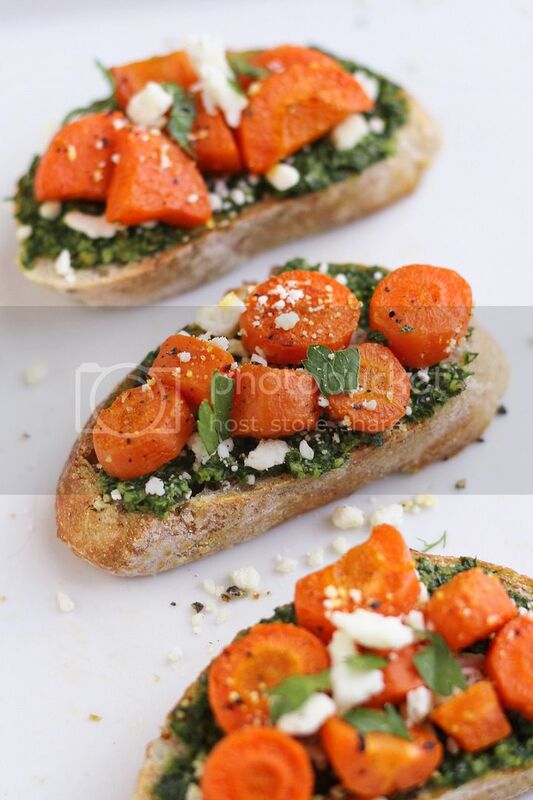 I loved how the bright flavours of the pesto balanced out the earthy carrots and salty feta. 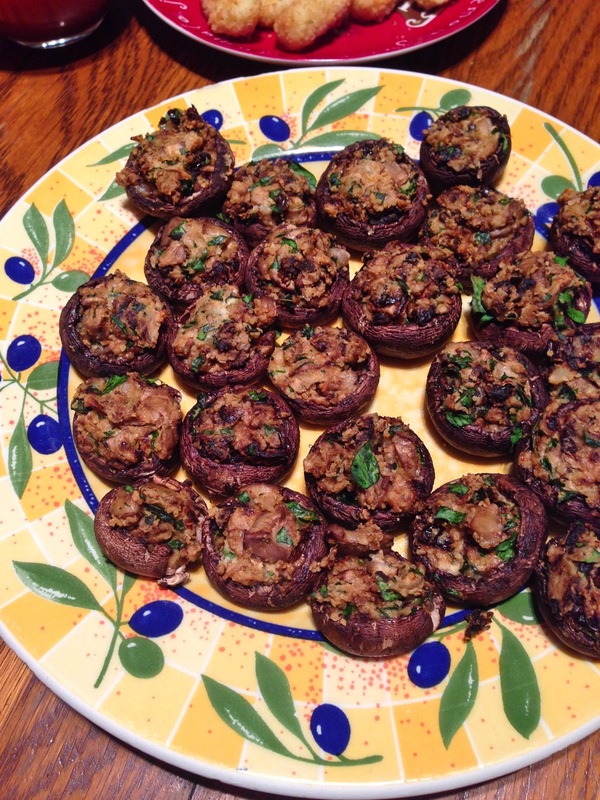 I'm in charge of apps for our family's Easter dinner this year so I think I'll be making these again! I hope you all enjoy the long weekend and have a happy Easter if you're celebrating it! Preheat oven to 400°F. 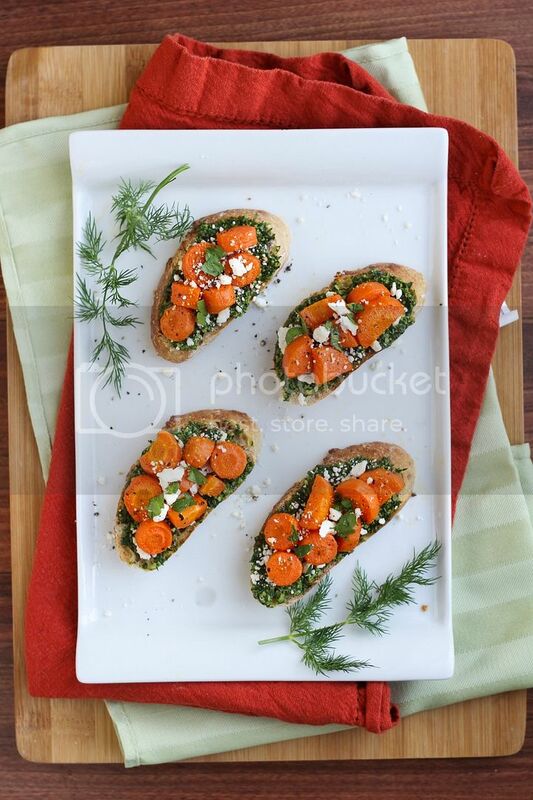 Toss carrots with olive oil, season with salt and pepper, and spread on a foil-lined baking sheet. Roast in preheated oven for about 30 minutes, tossing halfway through. Meanwhile, prepare dill pesto. Place all ingredients (dill, parsley, garlic, walnuts, lemon juice, oil, salt, and pepper) in the bowl of a food processor (I used the smaller bowl) and process until the pesto is as smooth as you can get it. Taste and adjust any seasoning or amounts to your liking if necessary. When carrots are done, leave oven on, and spray baguette slices with cooking spray. Set on baking sheet and let toast in oven for about 3-5 minutes, until toasted. 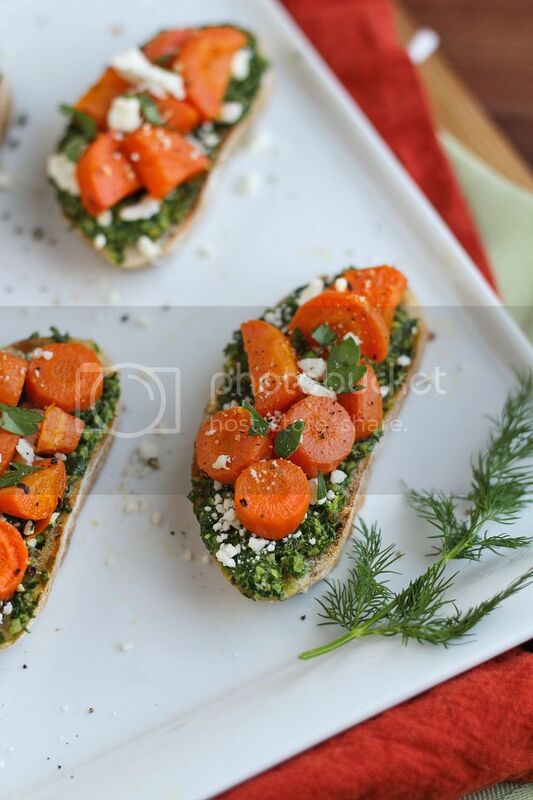 Prepare crostini by spreading pesto on baguette slices, top with crumbled feta and roasted carrots, and garnish with chopped parsley if desired. Serve while carrots are still warm. What I've Been Doing and Eating the Last Few Months! It's a little hard to summarize what I've been doing lately when my last post was from Halloween 2014 and I don't even know where the last four months went! I guess I should start by apologizing for my disappearance from this blog. My posting had slowed down considerably last year as I began to spend all of my time locked in my room writing my PhD dissertation. I then decided I had to stop all blog-related activities altogether in the fall as I prepared for my defense (which I passed!). Following that, I moved right into a heavy workload on a large project, and by the time I settled in and was able to make time for blogging again, it seemed like taking on another large job that I wasn't ready for. Now that I have a little more free time on my hands, I'm hoping to start getting back into somewhat regular posting. I can't promise anything, and any time this blog becomes more of a hassle or unwanted workload than a fun pastime I may slow down or stop again, but for now I miss sharing recipes with you guys and hope to have time to do it a little more often moving forward! Before I get back to posting regular recipes, I thought I'd share some of my favourite and random eats over the last few months, going back to last Fall! 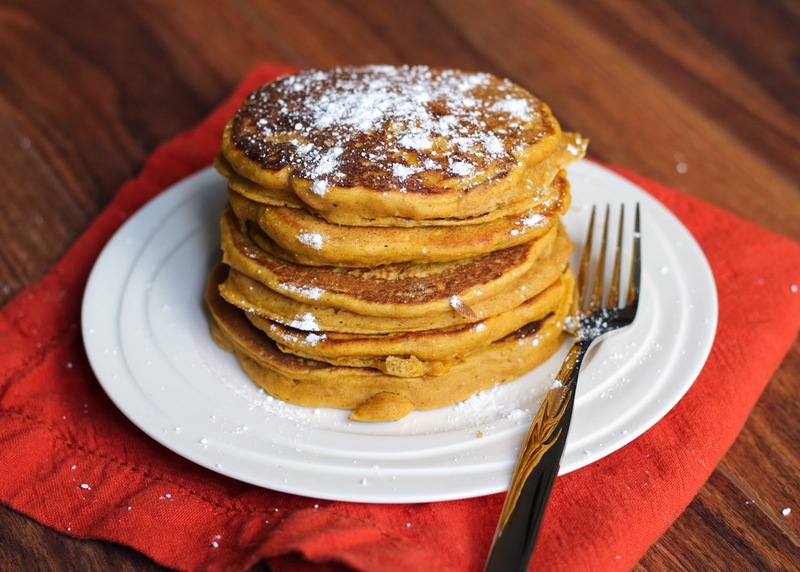 I can't remember which recipe I used for these pumpkin pancakes last October but they were fluffy and delicious. Essential fall breakfast eating! 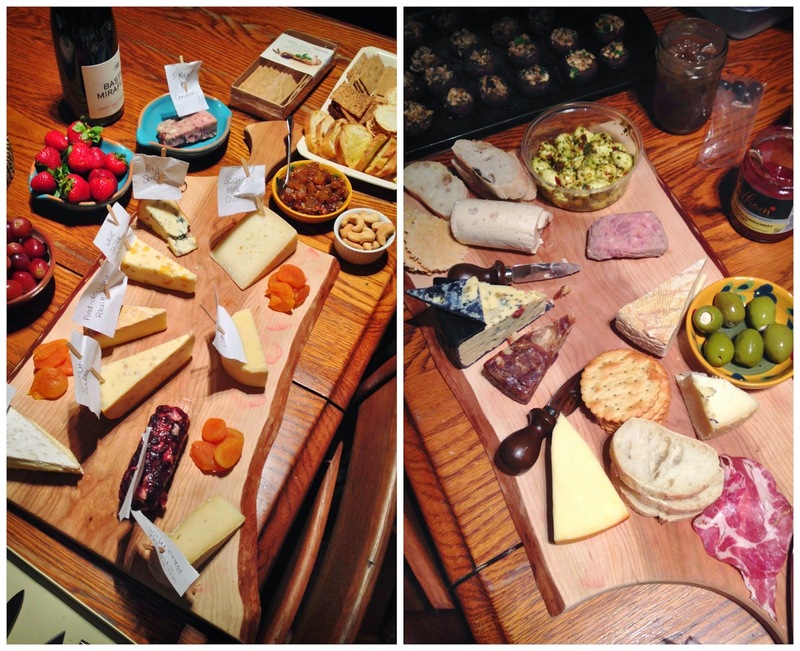 Over the holidays my family enjoyed many gatherings over cheese boards and charcuterie. If only I could eat cheese for every meal. 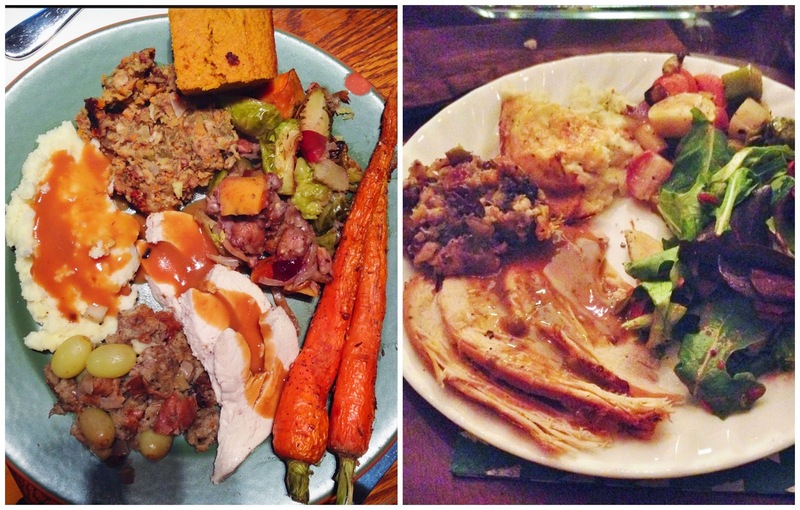 Pictured above were my Thanksgiving and Christmas dinner plates - my favourite meals of the year! All of my family members and relatives are amazing cooks and all pitch in, often trying new recipes so every year is different and exciting! 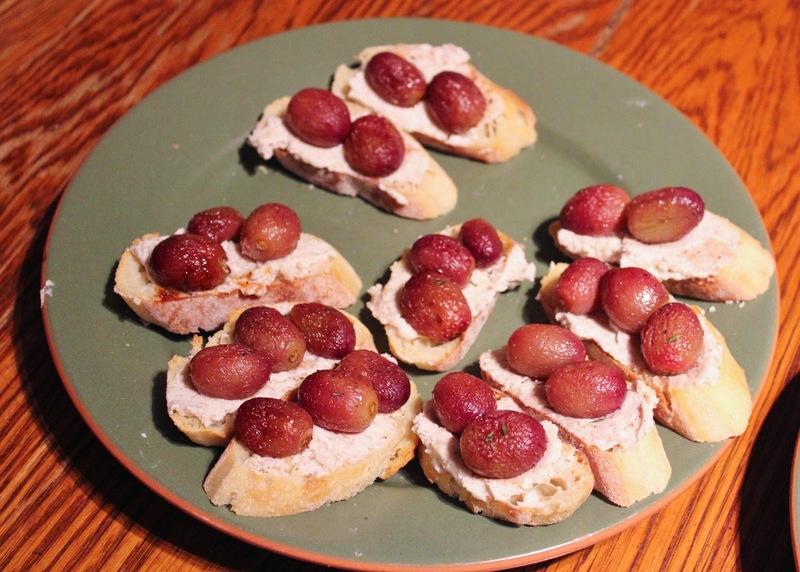 As a Christmas Eve appetizer I made crostini with roasted grapes and hazelnut goat cheese. This picture doesn't do it justice but it was really tasty; if you haven't tried roasted grapes before you might be surprised at how much you like them! The recipe I used is from MJ and Hungryman. On New Year's Eve we had an Italian food theme so I contributed some storebought antipasto and mozzarella sticks along with my Italian stuffed mushrooms and some caprese polenta squares. We also enjoyed a tomato mozzarella tart as well as other appetizers and delicious cannolis to end the meal! 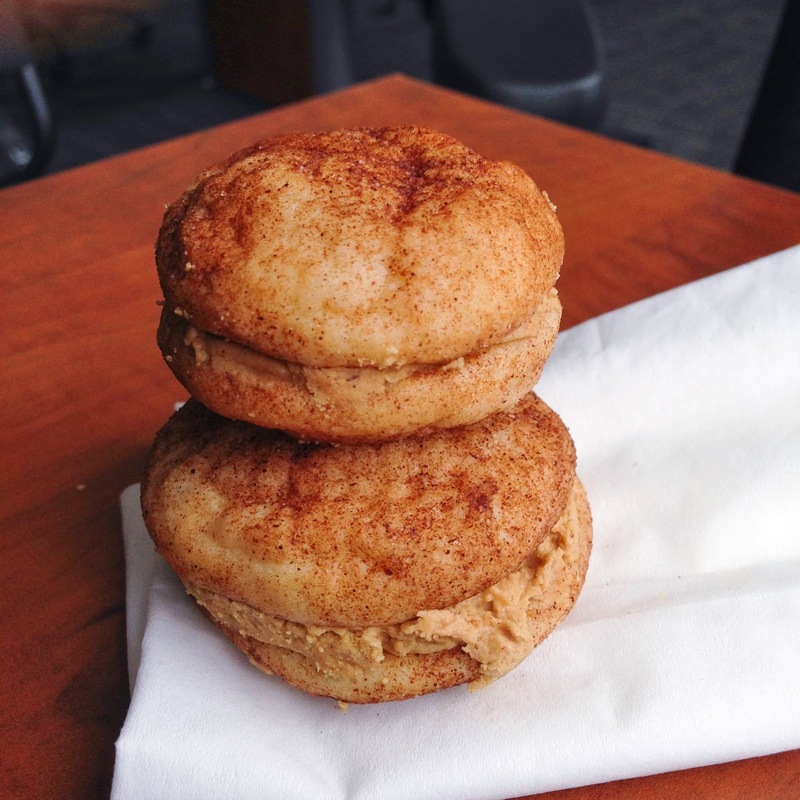 The only holiday baking I had time for this year were these snickerdoodle biscoff sandwich cookies from Two Peas & Their Pod, which were some of my favourite cookies I've ever made! I'll definitely have to make them again next year, though there's no reason to limit these to the holidays! 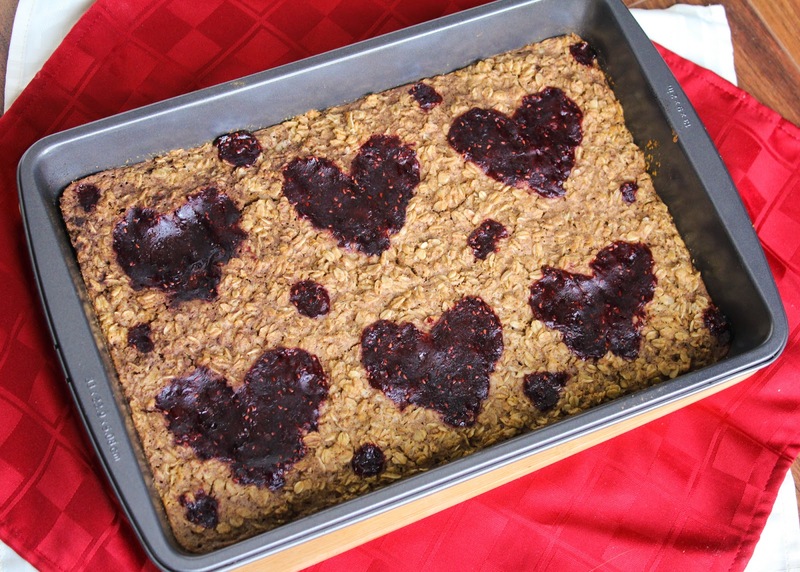 For Valentine's breakfast this year, I gave my baked peanut butter and jelly oatmeal a Valentine's twist by shaping the jam into hearts. It turned out so well for each portion to be topped with a heart, but this recipe is great any time of year too! 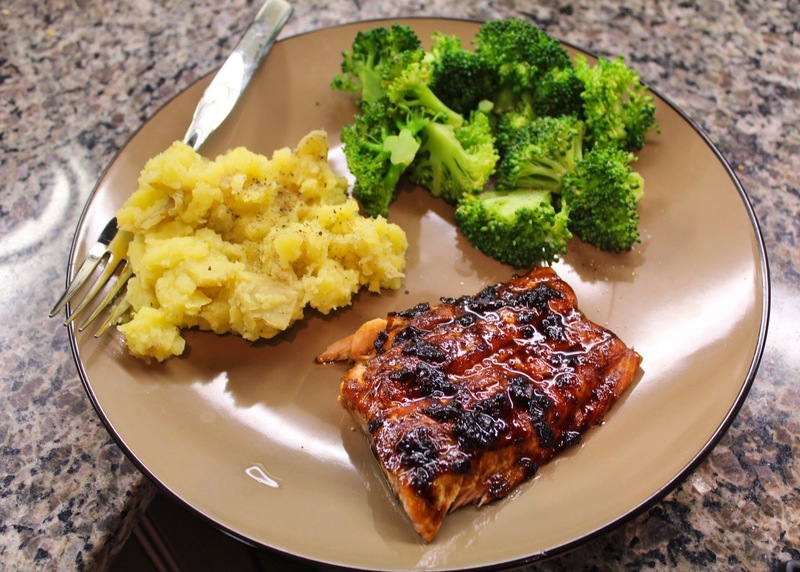 For our Valentine's dinner I made the Beeroness' molasses stout glazed salmon, served with Ellie Krieger's healthier mashed potatoes and some steamed broccoli for a lighter but still tasty meal. 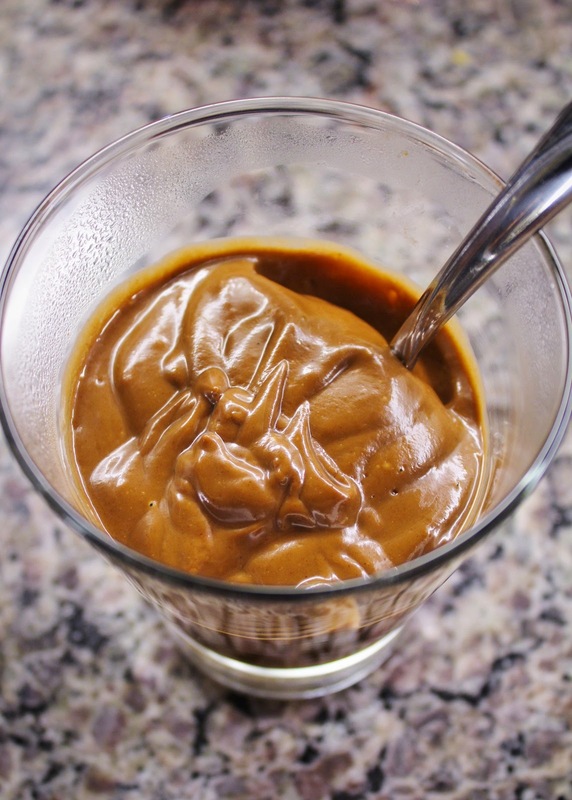 We followed our meal up with a healthy dessert too, trying avocado chocolate pudding for the first time. I know the poor lighting in this picture doesn't make it look good, but it was delicious! I couldn't taste the avocado but it made the pudding so rich and creamy. You have to try it if you haven't already! I used this recipe from Two Peas & Their Pod. 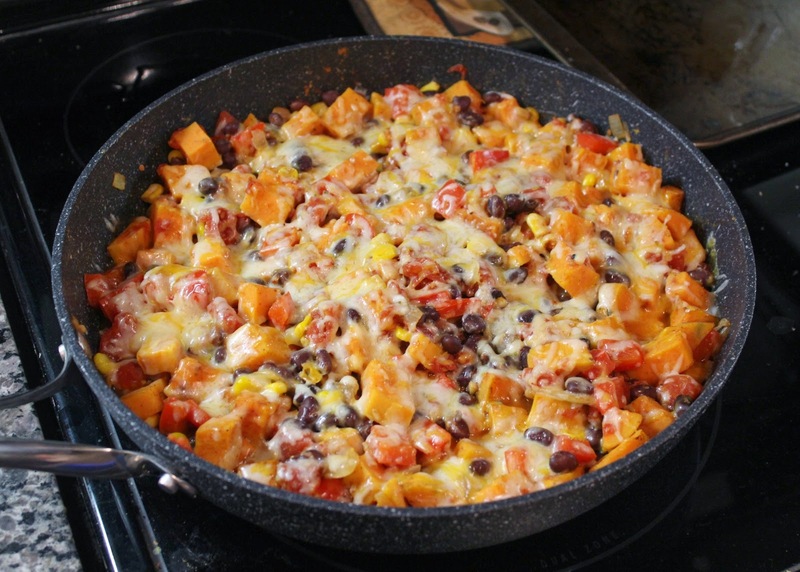 This easy tex mex sweet potato skillet from ifoodreal - there was nothing not to love about this meal! 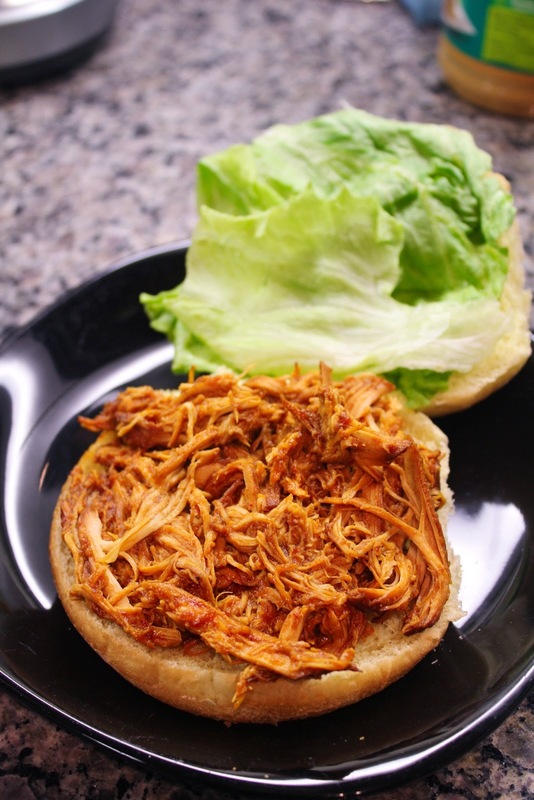 We've been using our slow cooker a lot lately for easy meals and our favourite is shredded bbq chicken - so easy and perfect for sandwiches. 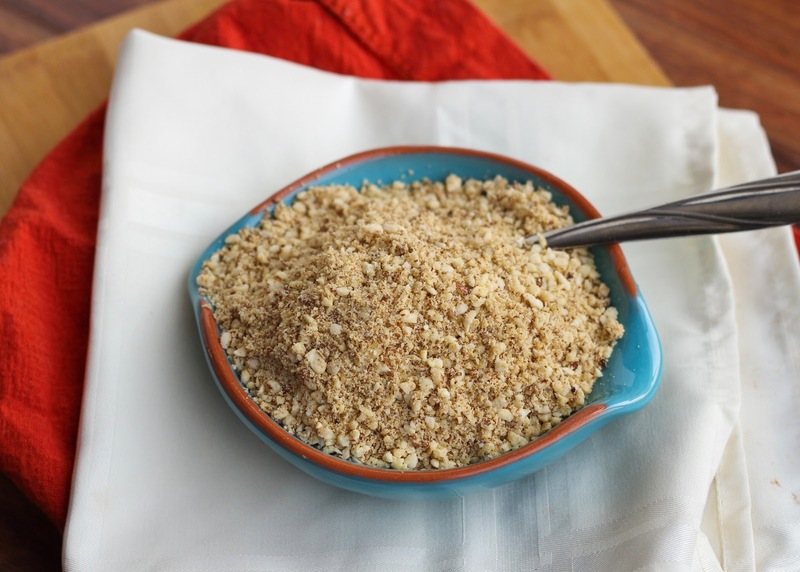 I tried vegan almond "parmesan" made by grinding almonds, nutritional yeast, and some seasoning in a food processor. It was surprisingly good and made a nice change from parmesan for topping pasta! 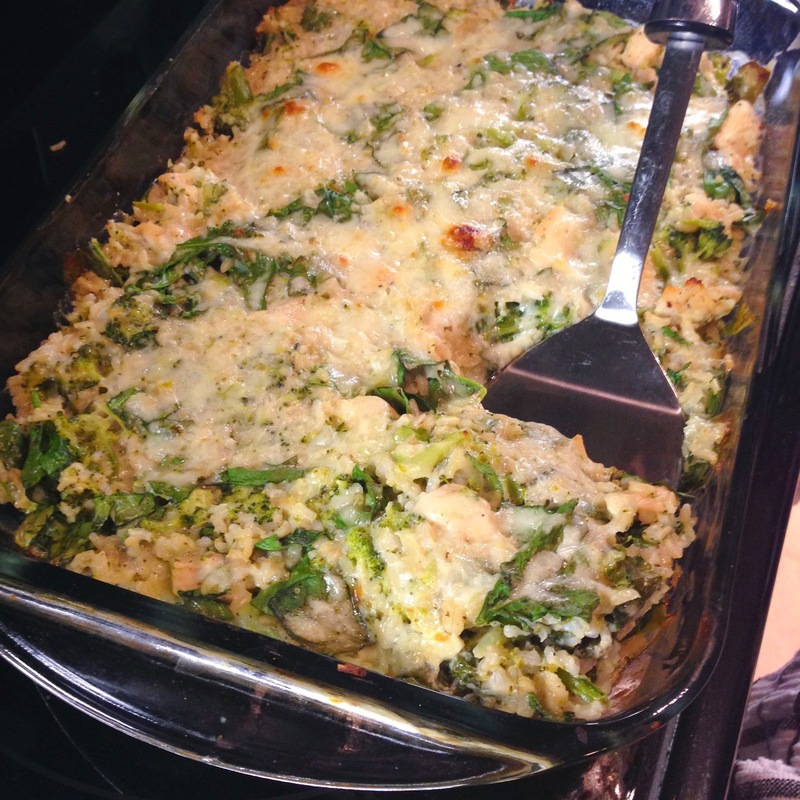 Another easy dish we've made a few times is this chicken, broccoli, and rice casserole with kale from ifoodreal, though I prefer making it with spinach. An easy and healthy weeknight meal! Since I've been working from home often, I love making smoothies for an afternoon snack - usually with frozen banana, almond milk, oats, flax, sometimes peanut butter, and spinach. So good! 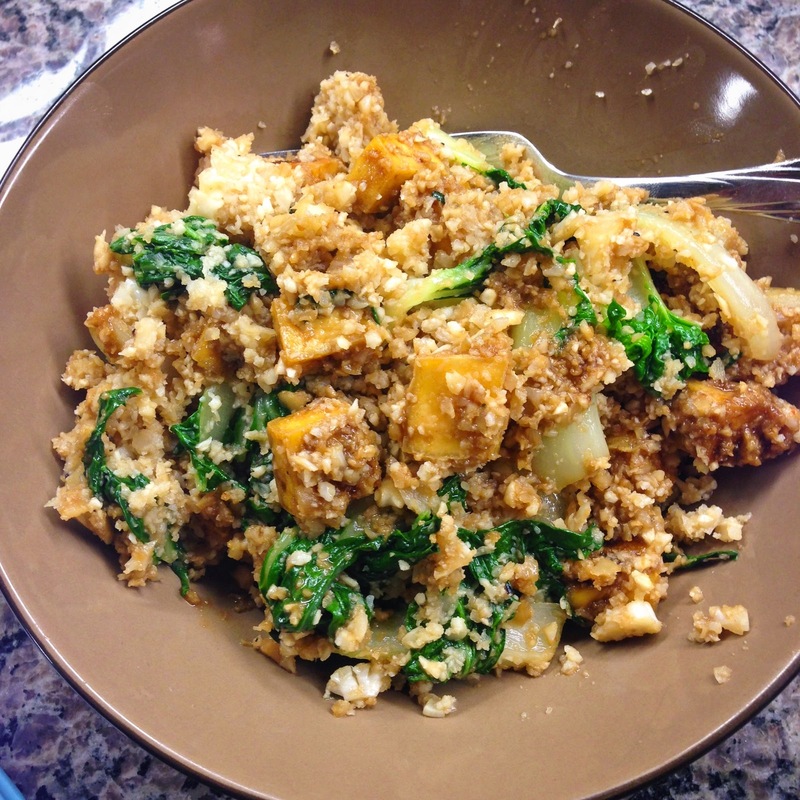 I tried cauliflower rice for the first time and loved it! I used it in this crispy peanut tofu and cauliflower rice stirfry from Minimalist Baker, which was a super flavourful and healthy meal that I can't wait to make again! 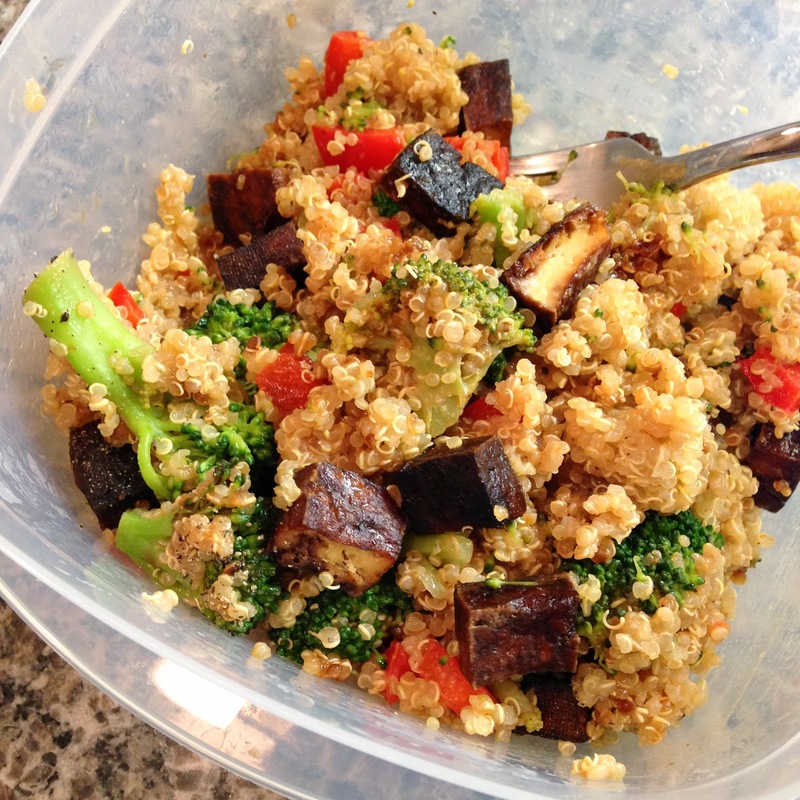 A similar recipe I make often is this peanut quinoa bowl with broccoli, red pepper, and tofu from Oh My Veggies. It's a little time consuming to prepare but worth it! 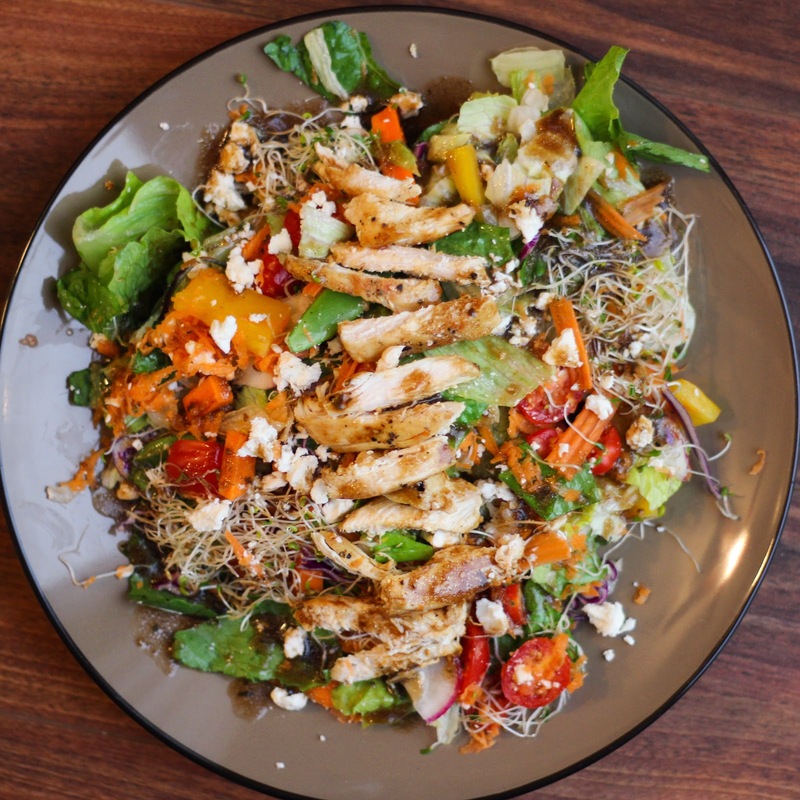 Often when we don't have time to plan dinner, we end up having salad, which is fine by me! 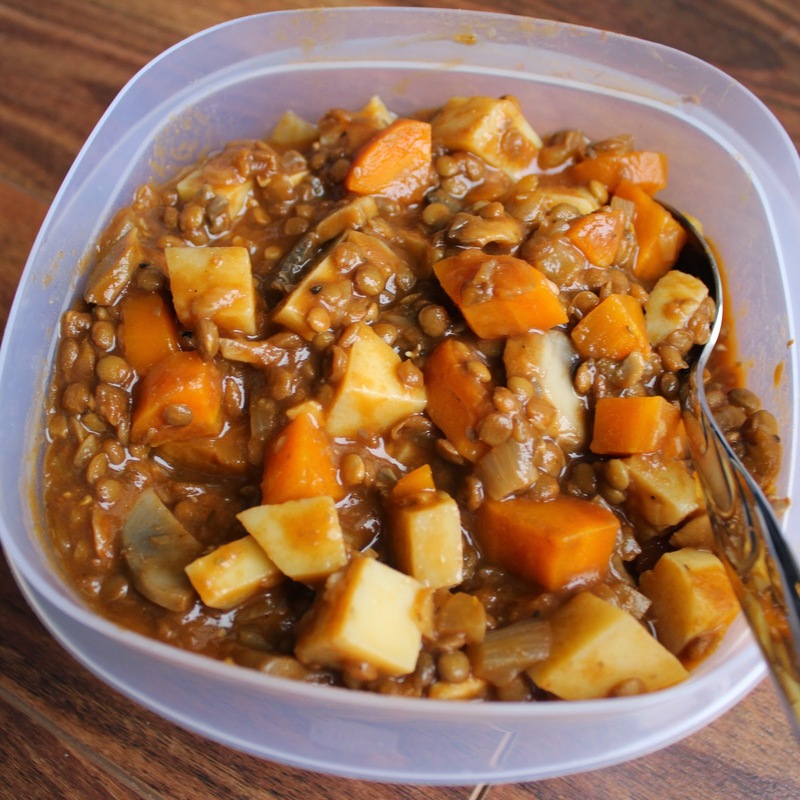 I love stews in the winter and my lentil and vegetable stew is filling, comforting, and healthy. I usually make it with some adjustments, including adding potatoes and using beef broth instead of vegetable broth. 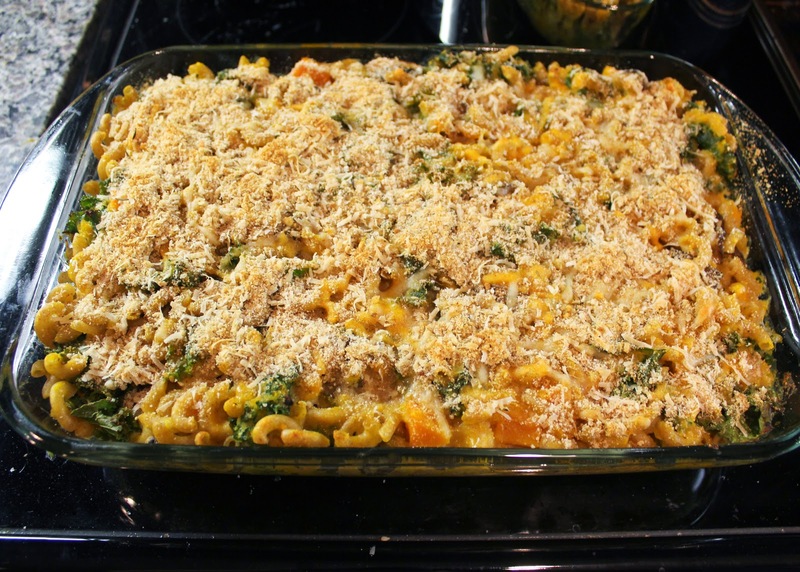 This "grown up mac and cheese" with whole wheat macaroni, squash, kale, and mushrooms was healthier than regular mac and cheese and still tasty! As is becoming apparent, I've been relying a lot on one-pot meals and casseroles lately! 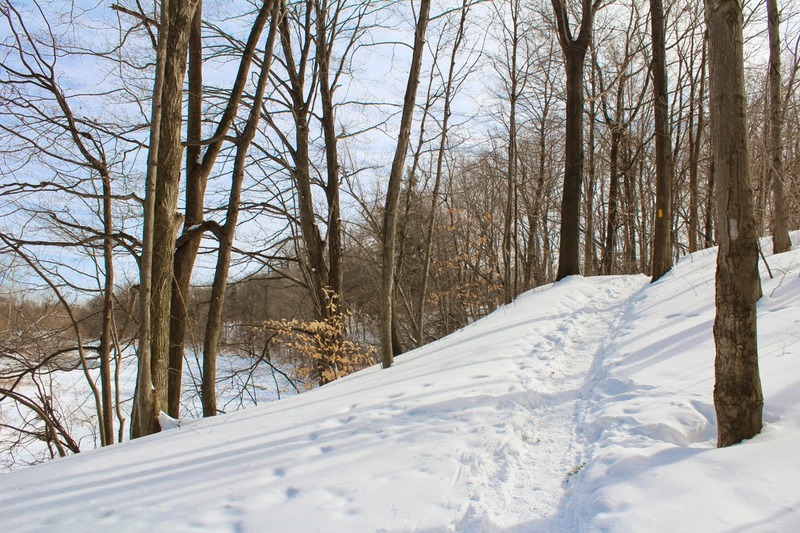 I've also gone on lots of cold and snowy walks this winter, which have been very refreshing, but now I'm ready for Spring and warmer weather! Finally, I post a little more often on Instagram, so feel free to follow along there if you're not already!